TEHERAN, Iran -- Iran stepped up pressure Saturday on the militant Islamic movement that controls Afghanistan, warning of possible military action as tension mounted over the fate of Iranians caught in the fighting in Afghanistan. The Government-run Teheran radio, in a commentary reflecting calls in the Iranian news media for a strike against the Taliban, which controls most of Afghanistan, said Iran had the right to take all necessary action against the movement. Iran accuses the Taliban of holding scores of Iranians, including at least 11 diplomats and a journalist who have not been seen since Taliban fighters captured Mazar-i-Sharif, headquarters of a rebel movement, on Aug. 8. 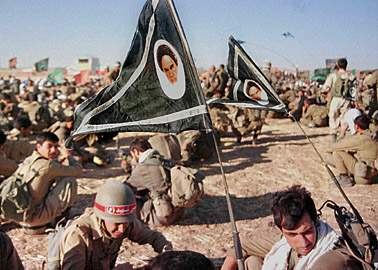 Iranian soldiers waving banners bearing pictures of Ayatollah Ruhollah Khomeini, the leader of their country's Islamic revolution of 1979, took part in a military exercise near the border with Afghanistan. Iran issued a stern warning to the Taliban after the movement's leader, Mullah Mohammad Omar, said the diplomats were "probably dead." Iran has also asked the United Nations to investigate. Iran has tried "to make the Security Council aware of a situation that can threaten international peace and security," the radio said Saturday. "After this process, Iran will have the right under Chapter 7, Article 51 of the United Nations Charter to take all necessary action in the context of legitimate defense." The Washington Post reported Saturday that American intelligence analysts had warned the Pentagon and the White House that Iran was poised to send thousands of troops and attack aircraft into Afghanistan imminently. Iranian officials were not available to comment. Iran sent 70,000 Revolutionary Guards, paratroopers and commandos to a northeastern area close to the Afghan border this week for three days of military maneuvers. It said that the exercises were a warning to the Taliban and that most of the force would remain in the area. An independent report in Pakistan said the Taliban had taken the unusual step of arming civilians in Nimroz province, which borders Iran, against possible attack from Iran or anti-Taliban fighters exiled in Iran. The Taliban has acknowledged holding 30 Iranian truck drivers but said it is not aware of the fate of the journalist and the missing diplomats, who were staff members at the Iranian consulate in Mazar-i-Sharif. An Iranian political analyst, Sadeq Zibakalam, said Iran is likely to attack. "Unfortunately it seems that we are quickly moving toward a grave situation," he said. "Iran wants to teach the Taliban a lesson. On the other hand it seems that some officials want to re-establish Iran's influence in Afghanistan through military means, something they tried and failed to do through diplomacy." Iran has close ties with the anti-Taliban coalition, who are mostly Shiite Muslims, as are the Iranians. The Taliban are Sunni Muslims. The two branchs of Islam split centuries ago in a dispute over the rightful successors to the prophet Mohammed. Has Anybody Seen This Girl?